Outlook Backup can help you to transfer all your Outlook data from one computer to another. Using Outlook Backup you can make migrations between different version of Windows and/or Outlook (for example from Outlook 2010 to Outlook 2013). 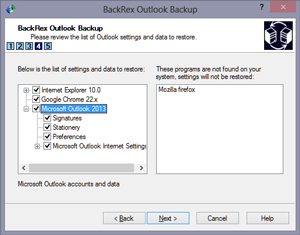 If you are looking for Outlook Express or Windows Mail backup tool, please visit BackRex Outlook Express Backup program page. Outlook versions XP, 2003, 2007, 2010, 2013 are supported. Allows you to switch between different versions of Outlook. 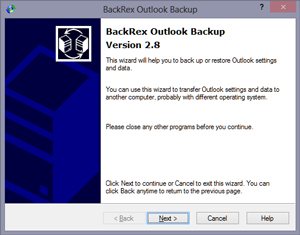 BackRex Outlook Backup can be ordered worldwide. Click here to order now. For immediate delivery, choose online order option. You will receive download instructions in just a few minutes after placing an online order, 24 hours a day, 7 days a week. Order now!